edited by Jose Enrique Aguilar Chiu; Richard J. Clifford, SJ; Carol J. Dempsey, OP; Eileen M. Schuller, OSU; Thomas D. Stegman and Ronald D. Witherup, PSS. Paulist Press (Mahwah, New Jersey, 2018). This excellent volume represents a major accomplishment in Catholic biblical scholarship in the 21st century. It summarizes biblical scholarship for those who “turn to the Scriptures in their ministry: preachers, religious educators, teachers, liturgy planners, spiritual directors,” and those who fill numerous roles in parishes and dioceses, in other words the educated laity. 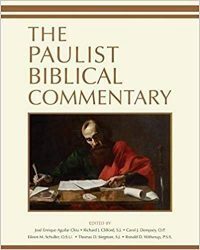 There is an ecumenical flair to the commentaries, since solid biblical scholarship in the 21st century takes into account the work of all those who consider the books of the Bible to be divinely inspired: Protestants, Catholics and Jews. The volume offers articles dealing with the Bible in the life of the church, the history of the biblical period, the development and canonization of the texts of the Bible, Jewish and Christian traditions of interpreting it, and monotheism. Interspersed in chapters dealing with each book of the Bible are essays on the Pentateuch, Wisdom literature, Prophetic literature, the Gospels and St. Paul. I highly recommend this book for all educated Catholics, and note that it will prove of interest to Protestants as well, though I prefer the term “Hebrew Scriptures” to “Old Testament,” since all the books of the Bible are divinely inspired.